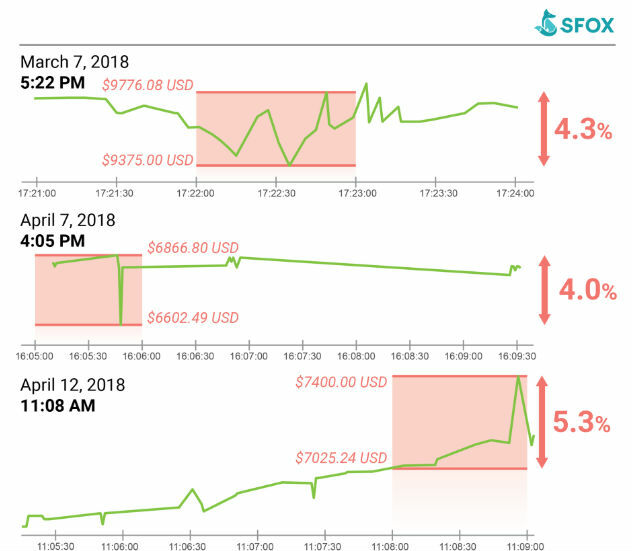 On four instances this past March through this May, the price of Bitcoin jumped upwards of 4% within minutes. Data like these have given Bitcoin the reputation as a highly volatile asset: that is, an asset with frequent, large swings in its price. Understanding (1) what Bitcoin volatility really is and (2) where that volatility comes from can give you a more holistic view of cryptocurrencies as an emerging asset class. In this article, we’ll cover both of these topics. “Volatility” is often misconstrued as being synonymous with “risk.” Before we dive into the details of Bitcoin’s volatility, we need to recognize to take a step back and understand why this is a gross oversimplification. Volatility is defined as the standard deviation of logarithmic returns on an investment. In other words, it’s a technical measure of the magnitude of an asset’s price fluctuation in a defined time interval. (We’ll be focusing on historical, or realized, volatility in this article, but stay tuned for articles on other measurements of volatility in the future.) 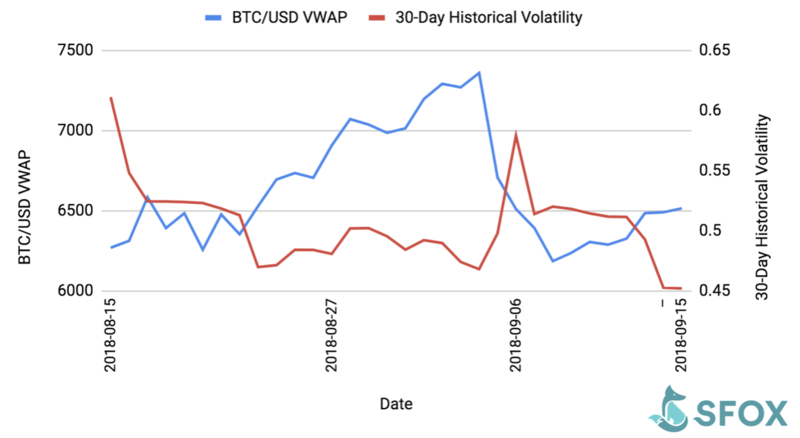 For instance, the 30-day rolling volatility of an asset—the metric we’ll be using to analyze BTC in this article—refers to how far away the daily returns of an asset are from its average returns over a 30-day period. Volatility can certainly contribute to risk. A more volatile asset, by definition, has larger price movements, which, in turn, could potentially result in prices further away from where the asset was bought or sold. Because of this, higher volatility could potentially lead to greater losses. That’s only half the picture, though. Higher volatility could also potentially lead to greater returns. In other words, more volatility doesn’t somehow make an asset inherently bad: it just puts it higher on the risk/reward spectrum. 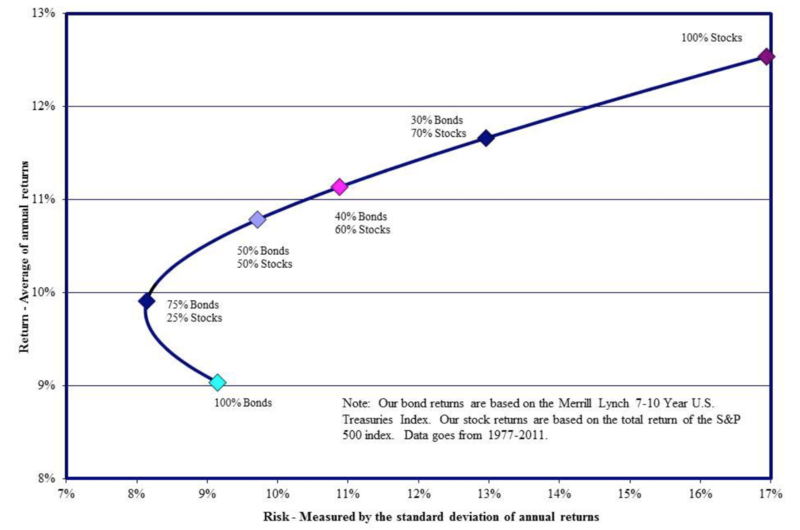 This principle that taking on more risk in a principled way can lead to higher returns is the basis of modern portfolio theory (MPT): to build a sound portfolio of investments, the theory says, one ought to be efficient by only taking on risk to the extent that it affords to with a proportionately higher potential return. MPT holds that the way to increase your portfolio’s return without taking on undue risk is by investing in relatively uncorrelated assets with high potential returns. That’s one of the principal reasons why diversification is so valuable in portfolio management. And so far, cryptoassets like Bitcoin make them look especially useful in this regard: they’re largely uncorrelated with other traditional asset classes. While cryptoassets tend to be highly correlated with each other (but notice that they’re not perfectly correlated), they have a near-zero correlation with the S&P 500, and only a slight negative correlation with gold. Therefore, if one believes that cryptocurrencies like BTC will generate positive returns over time, it could be promising as a way of increasing the risk-adjusted return potential of one’s portfolio. Ultimately, our goal in this article is not to help you build a diversified portfolio, but this point bears emphasis nonetheless. With mainstream news outlets calling Bitcoin and other cryptoassets “risky” as if that makes them inherently bad assets to hold or trade, one ought to remember that volatility and risk aren’t inherently bad: one just needs to understand where volatility comes from and how to rationally factor it into one’s overall strategy. While we’ll consider five factors that contribute to Bitcoin volatility below, it’s important to recognize that all of these factors ultimately boil down to three fundamental economic forces: supply, demand, and uncertainty. It’s a basic economic platitude that supply and demand determine the prices of assets—and when one or both of these suddenly change drastically, that can make the asset’s price much more volatile. As we’ll see below, there’s no shortage of events in the crypto space that can suddenly shift the supply or demand for a particular cryptoasset. The shape of the crypto market is also heavily molded by the uncertainty that multiple participants feel across multiple dimensions. When crypto developers are uncertain about the regulatory landscape and where they may or may not be permitted to do business next year, they can be led to act more hesitantly; the same goes for investors who are too uncertain about the real utility of crypto to take a large stake in it. We’ll see that this aspect of the market can end up making the crypto market’s volatility very sensitive to events whose impact an asset class with more certainty would be better able to absorb. Supply, demand, and uncertainty are at the core of understanding Bitcoin volatility – but it’s hard to track these abstract concepts in the market on a daily basis. Fortunately, these three forces manifest in a number of market events that are easier to track. We turn our attention to those events now. In a market as young and dynamic as crypto, there are bound to be myriad factors that contribute to the marked volatility that we regularly observe. With that said, however, five primary kinds of common events in the crypto space are poised to have a high impact on Bitcoin volatility. 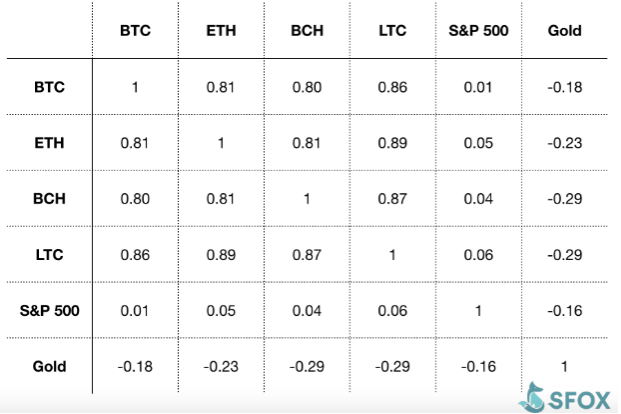 The uncertainty surrounding the crypto market makes assets like Bitcoin relatively illiquid: roughly speaking, that means it’s relatively difficult to efficiently convert BTC to cash (you can read more about the details of this topic in our in-depth analysis of Bitcoin liquidity). That’s because, when parties are less willing to take a stake in the asset, order books are sparser; there are fewer large orders; and price imbalances are slower to correct—and all of these factors are critical to an asset’s liquidity. One consequence of a relatively illiquid crypto market is that the behavior of a single large liquidity provider can have an outsized influence on the volatility of BTC and other cryptoassets. If and when such a provider experiences down time – whether that’s due to planned maintenance or a critical service issue – the market’s liquidity can suddenly shift drastically, with volatility shifting concomitantly. We saw an example of this a few months ago when major liquidity provider Bitmex, which has billions of USD worth of daily volume (according to CoinMarketCap), went down for planned maintenance. 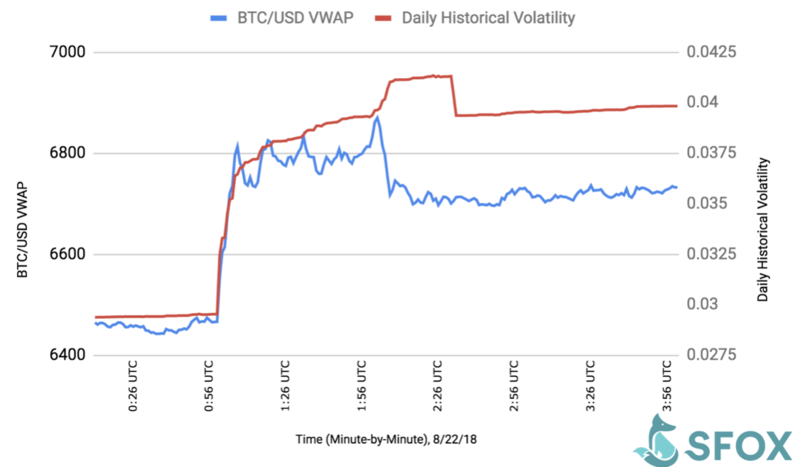 When the exchange, along with the liquidity it provided, vanished from the market from 1:00-1:30 UTC on August 22nd, the daily volatility of BTC spiked. In a timeframe that corresponded almost perfectly with Bitmex’s maintenance window, BTC’s daily volatility increased over 40%, from 2.9% to 4.1%. 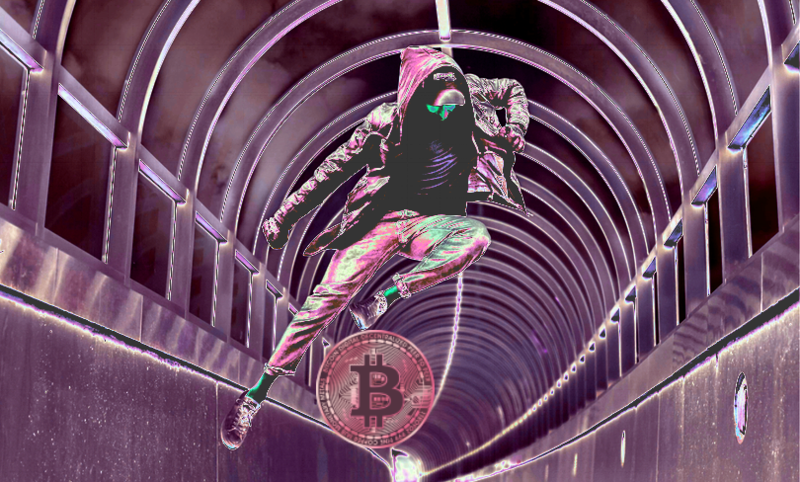 It didn’t matter that the exchange’s downtime was planned and expected: with the maintenance taking so much liquidity from an already fairly illiquid market, Bitcoin volatility was bound to be impacted. As the crypto markets continue to mature and more liquidity providers are connected, the impact of any one liquidity provider on volatility will probably be reduced, As it stands now, though, it’s a good idea to keep paying attention to the maintenance schedules of large exchanges. One of the main drivers of uncertainty in the crypto space is the lack of regulatory clarity. The corollary of this is that announcements providing new regulatory clarity have the potential to give people confidence to take new or larger stakes in crypto, which can have a significant impact on volatility. On September 11th, 2017, for instance, as word spread that China was cracking down on local Bitcoin exchanges, it kicked off a 6-day streak in which Bitcoin’s volatility climbed from 64% to 88%. As further regulations continue to be established in the world of crypto, supply and demand could fluctuate in response, increasing Bitcoin volatility. New regulations could allow new investors (e.g., heavily regulated institutions) to take on positions in crypto (increasing demand), or they could limit the operations of existing blockchain products (decreasing supply). Such changes could move the price of BTC in either direction – but either direction of change would increase BTC’s volatility. Because uncertainty about the crypto market still looms large, the support of a significant cryptoasset from a major liquidity provider can contribute to volatility: this can reduce the barriers to entry for investors looking to take on a position in the cryptoasset, and it can signal that the cryptoasset is more established, reducing people’s uncertainty about its future. That’s a recipe for increased volatility. That newly supported cryptoasset doesn’t need to be Bitcoin, either: so long as the pair of that asset and BTC experiences substantial trading volume, it can impact Bitcoin volatility. 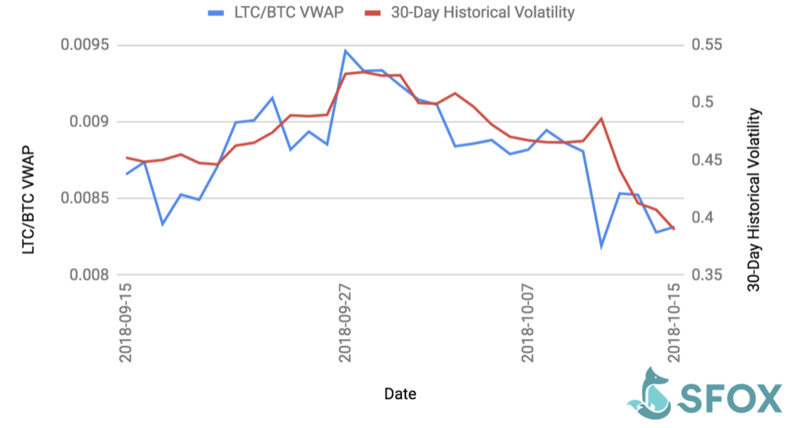 For instance, the LTC/BTC pair saw a 10% increase in rolling volatility in the three days following the September 27th enablement of Litecoin trading on SFOX. Support for a new asset from major liquidity providers has the potential to amplify volatility by allowing new groups of traders to enter the market and start actively trading. Uncertainty leads to illiquidity in the crypto market, which makes it harder for the market to absorb the impact of large orders, whether those orders are executed on an exchange or OTC. The result is that a single trade executed by a high-net-worth individual, institution, or pool can have an impact on the price of BTC, which can make a big difference to Bitcoin volatility. These sorts of giant Bitcoin-trading entities are typically called whales within the crypto world, and it’s in the context of volatility that this nomenclature makes the most sense. Like real-life whales, the enormous BTC wallet of a HNWI or institution may lie dormant and undetected for a long time; then, without warning, it becomes active, breaching the surface and causing enormous waves in the form of marketwide volatility. If you had been “whalewatching” at the end of August and beginning of September, you would have noticed this exact phenomenon at work. As u/sick_silk covered in a series of posts on the Bitcoin and BTC subreddits, a wallet containing roughly $1 billion USD worth of BTC, which had been dormant since 2014, began unloading hundreds of millions of dollars in BTC to exchanges between August 29th and September 6th of this year. It’s not 100% clear whether this wallet belongs to Mt Gox, someone associated with the Silk Road, or simply an early investor in Bitcoin (though Bitcoin security expert WizSec seems certain that it belongs to “an old Mt Gox whale”). What is clear is that the unloading of this wallet’s funds correlated with a marked increase in Bitcoin volatility. 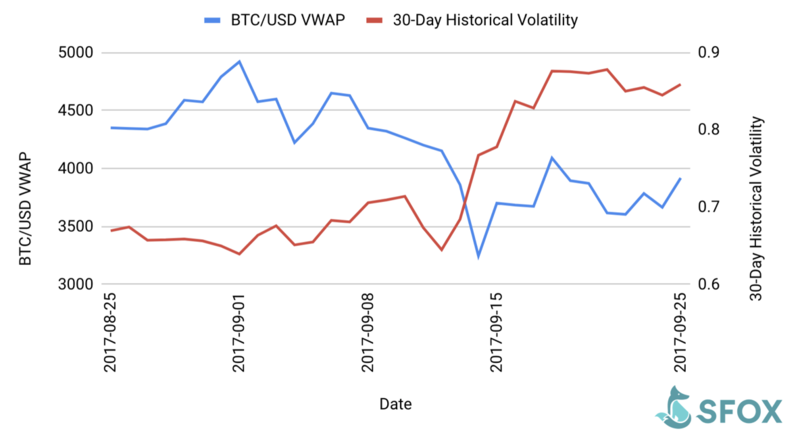 On September 6th, when the majority of these funds were dumped, Bitcoin’s price dove almost 15% while its rolling volatility rose almost 25%. For a sense of perspective on the influence of whales, it’s worth keeping in mind that the 100 wealthiest Bitcoin addresses control almost 20% of BTC in circulation, according to BitInfoCharts – and more than one of these could be controlled by a single entity. The movements of any such entity are enough to radically increase the marketwide volume, which can lead to large price movements that result in Bitcoin volatility spikes. Despite many of them being hailed as inflation-resistant, cryptocurrencies have engineered not one, but two ways to flood the market with increased supply very quickly: (1) airdrops and (2) hard forks. An airdrop is the distribution of new coins to a certain set of addresses, usually either for free or as a reward for the address owners having performed certain community-building tasks, such as engaging on the coin’s Telegram. In a sector that’s increasingly saturated with new coins and blockchain projects, an airdrop can be appealing as a way to bolster the engagement of a community and draw the attention of new crypto enthusiasts to a project. A hard fork is what happens when certain nodes in a network elect to update to a new software version that renders them incompatible with older versions of the network. This is what happened after the DAO hack, when Ethereum forked from Ethereum Classic; this is also what happened when Bitcoin Cash forked from Bitcoin. Ordinarily, addresses that are holding the cryptoasset of a network pre-fork are eligible to receive the cryptoassets of the new network following the fork. While hard forks are contentious within the crypto community, they can be an effective way for sub-communities to rally behind new network updates without derailing the broader community in the process. Although airdrops and hard forks are technically distinct processes that serve very different roles in the crypto world, they’re functionally identical when it comes to their impact on volatility. Each process floods the market with new supply of a cryptoasset, and can also increase the perceived value of whatever cryptoasset granted holders access to the airdropped or forked assets (thus driving up demand). That’s a recipe for amplified volatility. Nebulas provided a textbook example of airdrop-related volatility over the last month. On October 1st, Nebulas announced that it would be issuing ATP – tokens for Atlas Protocol, a blockchain-based advertising project built on Nebulas– to holders of NAS, Nebulas’ mainnet token, via an airdrop on October 15th at 16:00 UTC+8. 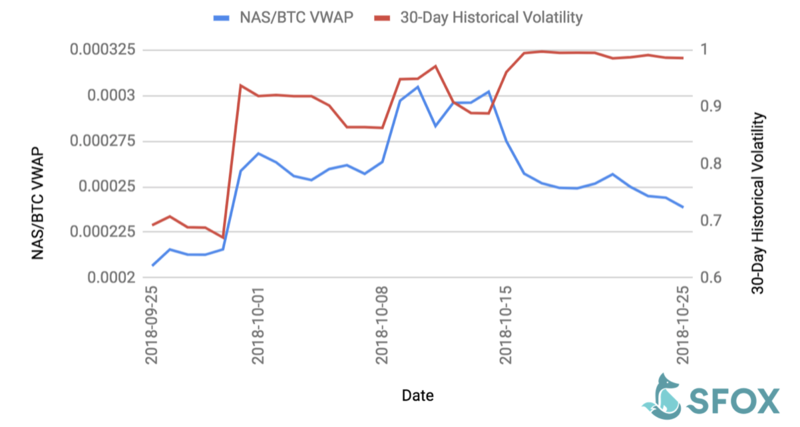 That mere announcement sent the rolling volatility of the NAS/BTC pair from 70% to 95%, a 35% increase. Note: NAS data drawn from Binance’s API. Notice that, on the above graph, there are no fewer than three distinct spikes in the volatility of the NAS/BTC pair. These correspond with distinct events surrounding the airdrop: Nebulas announcing the airdrop (October 1st), Nebulas announcing more details about the mechanics of the airdrop (October 8th), and Nebulas taking a snapshot of mainnet NAS addresses to determine ATP distribution (October 15th). This is a similar pattern to what we’ve seen in the cases of events such as new coin listings. When it comes to price volatility, news of an upcoming event can be just as impactful as the event itself. Ultimately, the volatility of an asset like BTC isn’t synonymous with “risk”. Volatility is just another aspect of the crypto market that can inform a principled trading or investment strategy. But Bitcoin volatility won’t illuminate your perspective on the market if you don’t know where it comes from or how to respond to it. We’ve only covered the tip of the iceberg in this first article. Stay tuned for much more on volatility in the crypto market, including how it plays into specific trading strategies and how it’s changing within the young, constantly evolving asset class. Report compiled by the SFOX Research Team, which provides holistic analyses of the crypto market geared towards sophisticated traders and institutional investors. The report was originally published on the SFOX blog.